Videos circulating online show a youth staring at and standing extremely close to an elderly Native American who was singing and playing a drum. Other youths surrounded them, laughing and shouting. Laura Keener of the Roman Catholic Diocese of Covington in Kentucky said Saturday it regrets the incident and is investigating. In a joint statement, the diocese and Covington Catholic High School in Park Hills said that they condemn the actions of the students and apologize to the man in the video, Nathan Phillips — an Omaha elder and Vietnam veteran. 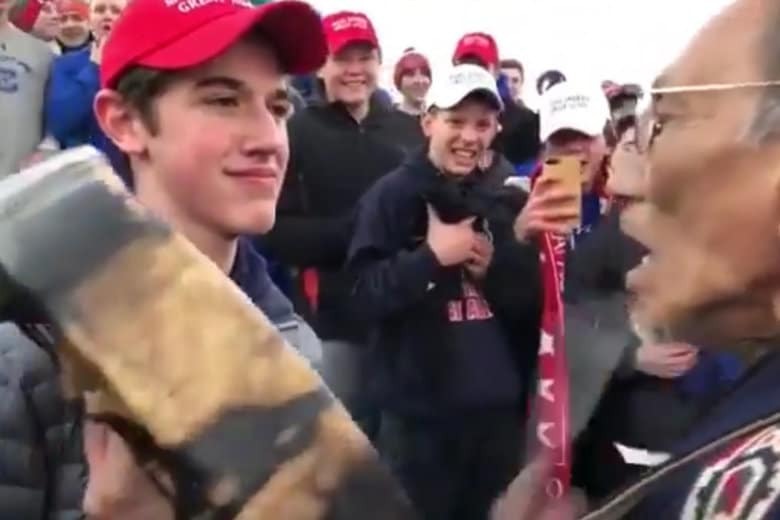 Other youths, some wearing Covington clothing and many wearing “Make America Great Again” hats and sweatshirts, surrounded them, laughing and jeering. Below is the video from YouTube user KC Noland. Phillips, the man playing the drum was identified by the “Indian Country Today” website. He holds an annual ceremony honoring Native American veterans at Arlington National Cemetery.